No risk. No credit card. No billing. Just fill out the short, secure form below. We'll start working right way on your free trial request. Please enter your work email, not Gmail, Hotmail, Yahoo, Outlook, AOL, etc. No work email? Call us at 203-375-7200. Have you used a media monitoring service in the past? A CyberAlert representative will contact you within 24 hours to discuss your monitoring/ analytics goals and your keywords. Subscribe me to Media Measurement News weekly educational newsletter on PR, marketing and social media. Your privacy is important to us. We will not sell or share your information. CyberAlert reserves the right to reject any free trial request. One free trial per organization. Get more comprehensive news and social media coverage — local, national or worldwide. Receive detailed readership data about your clips. Manage and store clips in a full-featured and easy-to-use online dashboard with customized metrics and really useful analytics. Complete the form to begin your FREE trial today! 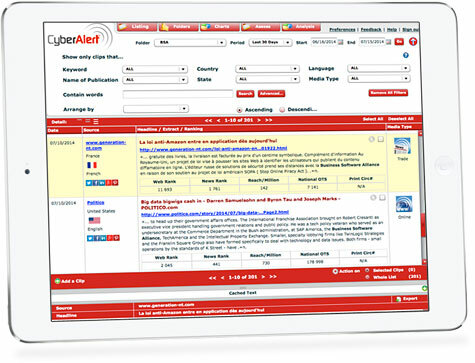 CyberAlert's 14-day media monitoring/media analytics trial is absolutely free. There's no risk, no obligation and no credit card required. No automatic billing. ©Copyright 1999- CyberAlert®, Inc. All Rights Reserved.